Lamb heads the department of MI-5 known as Slough House, a place of exile for disgraced and discredited agents who have been relegated to obscurity and menial desk jobs. The name Slough is well chosen. Slough House is for the sloughed-off and the literal swamp of John Bunyan's Slough of Despair. Lamb has surrounded himself with a quirky ensemble of alcoholics, drug users, and psychopaths who exhibit the social skills of dead mackerels but without the charm. In short, a cast of unlikable, unlikely characters who come to life through Herron's crisp, sardonic dialogue and biting narrative observations that captivate the reader like the slow-motion onslaught of a train wreck. Slough House's talent: take a bad situation and make it worse. In this, the fifth Slough House novel, terrorists have massacred citizens in a rural English village. Then a pipe bomb is tossed into The Watering Hole at the London Zoo, creating carnage among the penguins. And when a bomb is found on a London train, British intelligence races to discover the perpetrators, to determine if the attacks are linked, and to prevent further atrocities. All the security services are engaged except for Slough House, which is specifically and purposely isolated from the national operation. However, the dysfunctional team is more than involved. One member knows what binds the attacks together and what's coming next. But another inadvertently has provided the terrorists with the template for their horrific actions. Lamb and Slough House invoke London Rule #1: Cover your arse. But in executing Rule 1, they must also activate a more difficult London Rule: Stick together until you don't. Each member must find inner strength to collaborate with colleagues they despise and rise to the challenge for the survival of all. As the fifth novel in the series, London Rules alludes to events and relationships from previous books. Although this story stands on its own, the number of characters introduced upfront can be hard to follow and delineate. If one has read the other books in the series, such a problem will be minimized. 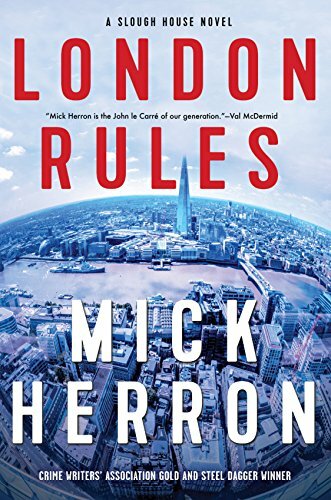 Publicity blurbs regarding London Rules compare Mick Herron to John le Carré and Len Deighton. A more accurate comparison on this side of the Pond might be Kurt Vonnegut, Jr., a writer whose dark, satirical novels question the absurdities and pretensions of his time with the gallows humor like that interlaced throughout Herron's work. Slaughterhouse Five converted and updated to Slough House Five. Instead of living under the shadow of The Bomb in the Cold War, the dusk of uncertainty hangs over our time with an unpredictable president on one side of the Atlantic and Brexit on the other. Herron poses that to get from dusk to dawn we must pass through night. But London Rules is not a novel of hopelessness. Shining moments are possible and that is the redeeming London Rule embedded beneath the cynicism and sarcasm. Herron writes, "That is what London and its sister cities have learned: that crime pollutes the soul, but only the souls of those who commit it. When those who mourn stand together, their separate chimes sounding in unison if only for a moment, they remain unstained." In our post-9/11, school-shooting, child/parent-immigrant-separating stained world, London Rules forces us to peer into the shadows and confront our darkness. For what better way is there to recognize the light? Mark de Castrique's most recent novel is Hidden Scars (Poisoned Pen Press). He is the author of 17 mysteries and has worked in the television production industry for more than 40 years. His most recent book is Secret Undertaking (Poisoned Pen Press).